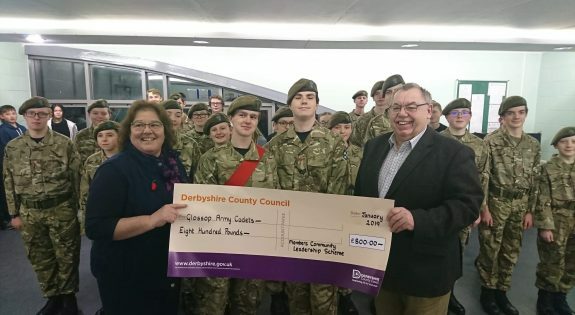 Cadets and adult volunteers from Derbyshire Army Cadet Force’s Glossop Detachment were presented with a cheque for £800 on Thursday 10 January by Councillors Jean and John Wharmby. The funding comes from the Councillor’s community fund and will go towards new equipment to help the cadets complete the expedition element of the Duke of Edinburgh Award. Taking part in adventurous expeditions is a key part of the Bronze, Silver and Gold Duke of Edinburgh Awards. Memebers of the Army Cadet Force are encouraged to take part in the Award, in Derbyshire more than 20 Gold Awards have been presented in the last year. 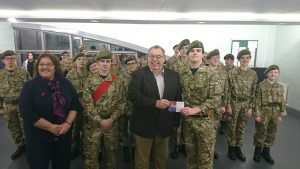 Jean and John Wharmby, who sit on both the High Peak Borough Council and Derbyshire County Council, were overjoyed to present the cheque to aid the cadets in their future expeditions. The Councillors also took this opportunity to present a thank you card from the Royal British legion for the cadet’s hard work in selling poppies for the Poppy Appeal, the cadets raised over £1,800. Glossop detachment is the largest detachment in the county, with 60 cadets reguarly parading at the detachment. The cadets work on military themed subjects such as navigation, first aid, shooting and adventurous training on a weekly basis alongside getting out in the community to help out at local events such as the vintage vehicle show earlier this year.